While the rest of the world engages in addressing the Climate Crisis, Trump is the outlier. We, here in the U.S., have been struggling for months to deal with the fact that the Trump administration is doing everything in its power to increase consumption of dirty, climate-altering fossil fuels. Not only has Donald Trump appointed climate change deniers—including EPA head Scott Pruitt and Energy Secretary Rick Perry—to key positions in his administration, but he has been greenlighting pipelines, eliminating regulations, promoting fossil fuel export, killing the EPA Clean Power Plan, using the bully pulpit to exhort the virtues of coal and withdrawing from the Paris Climate agreement. So, you may ask, where is the good news? Well, in case you’ve missed it, the rest of the world isn’t joining Trump in rejecting the scientific consensus that climate change is real and represents an existential threat. 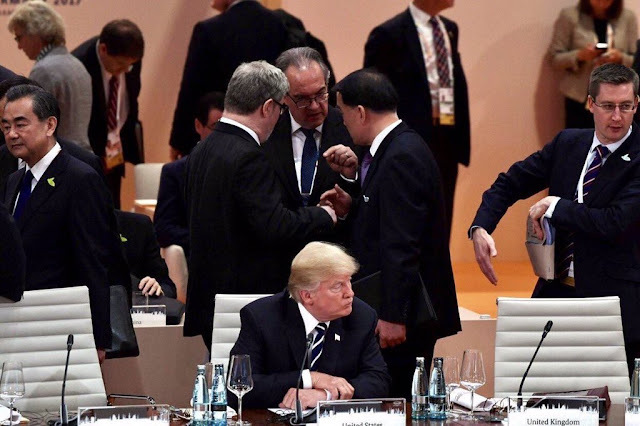 In fact, at the recent G20 meeting in Germany, when it came to the issue of climate change, according to The Guardian, the “outcome was a 19-1 standoff pitting the US against the rest of the world.” And let us not forget that the G20 includes several nations—Russia, Canada and Saudi Arabia among them—that are major fossil fuel exporters. None, however, aligned with Trump or rejected the Paris Agreement. Now most governments around the world aren’t yet where they need to be; not by a long shot. But they’ve been moving in the right direction. Almost everywhere, public opinion has shifted decisively in our direction, and political leaders realize they have to, at the very least, pay lip service to the need to end our use of fossil fuels, replacing them with clean, renewably-sourced energy. And many are doing more than paying lip service. Numerous countries are way ahead of the United States in terms of investment in energy efficiency and renewables. They are finding these investments produce jobs, reduce expenditures on (often imported) fossil fuels, and help create not just a cleaner, healthier environment, but also prosperous, sustainable local economies. · Educate, educate, educate. Unlike most countries, a significant fraction of our population has been conned by industry, industry-sponsored politicians and industry-friendly media to believe that Climate Change is a “hoax” or that there still is not enough information to decide if humans are the cause. We in the climate movement need to take seriously the need to educate Americans as to the harm our inaction is causing and simultaneously let them know how beneficial transforming our energy economy will be. Our efforts include public programs, film screenings, our speakers bureau and more. Peaceworks and our allies embrace this work wholeheartedly and invite your participation in our outreach efforts. · Keep the Climate Crisis visible. Through public demonstrations, rallies and events like our annual 5K Walk for the Climate (Plan to join us for this on September 24.) we keep the issue in front of our fellow citizens. We also take this issue publicly to politicians’ doors and do what we can to make the citizenry aware of their stances. · Work to pursue policies enabling effective climate action at whatever level we can. This includes the municipal. We recently saw the Columbia City Council, with significant input from Peaceworks and our climate action allies, unanimously embrace the adoption of a resolution aimed at moving CoMo forward on the climate front, including the creation of a city climate action plan. This sort of effort should be pursued more broadly in cities and towns across the state and beyond. Likewise, rural electric coops should be pressed to go green and adopt policies that encourage and help fund energy efficiency improvements and the use of clean, renewable power. Again, Peaceworks members have a critical role to play in moving efforts like this forward. · Embrace personal actions to live more sustainably. We at Peaceworks, through our Center for Sustainable Living, have been doing what we can for more than a quarter century to educate on the importance of sustainable lifestyle choices. While it is challenging, in our hyper-consumptive culture, to encourage simplicity and the embrace of a more satisfying, less consumerist worldview, we continue to promote use of renewable energy, gardening and the support of local food production, muscle-powered transportation, greener cars, energy efficient homes, less packaging, reuse and durable goods over disposables and many more sustainable practices that not only reduce our personal carbon footprints, but serve as role models for others. We are currently preparing for the October 15, 2017 Sustainable Living Fair and invite your participation in these efforts as well. The bottom line here is that climate change is arguably the defining issue of the Twenty-first Century. It’s not something that has come up, will be quickly solved and then forgotten. It is a concern we will collectively struggle to address for the rest of our lives. It also is something we can ill afford to either ignore or leave for others to address. It’s up to all of us to engage in effective, sustainable activism. We invite and encourage your participation. Peaceworks has two standing committees, our Climate Action Committee and our Sustainable Living Committee, both of which are eager to have your input and participation. If you are interested, please contact us at mail@midmopeaceworks.org. We can let you know options for getting involved.